This book is now also available as audiobook . Listen to the first half of the first chapter. Includes 10 unpublished letters to and from Mulholland. THE MAGICIAN: John Mulholland's Secret Life is drawn from never-before-seen documents and includes many unpublished photographs. A total of 80 photos are reproduced. It will appeal to readers of theatre, magic and war history. "Ben Robinson has thoughtfully and beautifully synthesized the pile of personal notes and documents which is the legacy passed from John Mulholland to Milbourne Christopher, to Maurine Christopher and finally to author Robinson. No better foundation exists for learning what made John Mulholland into magic's most influential voice in the 20th century. This book tells that story." John Mulholland (1898-1970) edited the magician's magazine The Sphinx for 23 years, ending the publication to be consultant to the newly born CIA in 1953. His assignments included working with billionaires and inventors, cracking codes and delving into the clandestine world of ESP research, LSD use and the secret MK-ULTRA world headed by the notorious Dr. Sidney Gottlieb. During this period, CIA Dr. Frank Olson died the day after Thanksgiving, 1953. 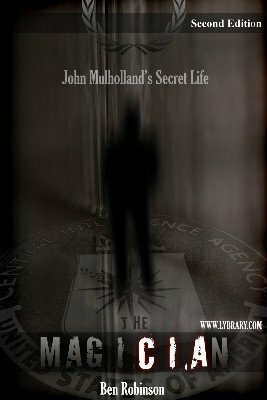 This book examines Mulholland's role during this dramatic period in the CIA's history and goes against the current trend of accusing Mulholland as having a role in Olson's fatal fall from a hotel window. John Mulholland was "The World's Master Magician." He performed in forty-two countries, authored ten books and performed at the Roosevelt White House eight times. His 90-minute stage show was carried in two suitcases and included impersonations of authentic Hindu and Chinese mysteries. Theatre critics spoke about him as they did a great actor. John Mulholland was an intellectual patriot who provided an essential component of counter espionage during the Cold War's Red Scare. 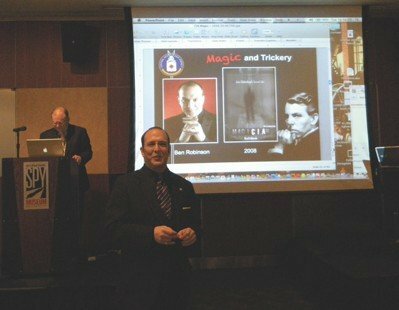 THE MAGICIAN: John Mulholland's Secret Life is the first biography of the man Dr. John N. Booth defines in his Foreword as "the most influential voice of the art of magic in the 20th century." In the foreground Ben Robinson is seen at the International Spy Museum in Washington D.C. on October 20, 2009. In the background, H. Keith Melton, one of the authors of the new CIA release of John Mulholland's writing for the Agency from the 50's. Melton and Robert Wallace co-authored the introduction to Mulholland's writing, renamed The Official C.I.A. Manual of Trickery and Deception . Robinson was invited by Melton, to be acknowledged for his original research into Mulholland during their world premiere. 1st edition 2008; 263 pages. 2nd edition 2010; 305 pages. I had the pleasure of hosting Ben Robinson at our home/theatre last week, to deliver a lecture on the subject of this book, John Mulholland. He enthralled the entire audience for nearly two hours with stories of Mulholland's life as a performer, author, lecturer, editor and consultant to the CIA. As a bonus, he performed several of Mulholland's signature effects and even taught one of them. All in all, a very informative, entertaining and fascinating evening for all. I highly recommend this book to anyone with an interest in magical history and if Robinson is appearing anywhere near your area, do not miss him. This lecture kept me in my seat all the way through. One of the most interesting lectures I have ever seen. Totally fascinating and informative. The three Mulholland effects Ben performed were terrific. I highly recommend that you get this book as it will be extremely enjoyable. Author Robinson presents an erudite and illuminating read, filled with the wonder of magic and the hard facts of history. He brings to life a fascinating character in John Mulholland, and little known events with wondrous revelations, heretofore hidden from the public at large. The enormity of the the author's research and writing efforts are in evidence throughout. If anyone thinks government malfeasance began with Nixonian manipulations and reached it's nadir during the recent Bush years, this story must be examined closely! "The MagiCIAn" is a must read page turner. I am an avid reader of books, all types of books, but not since Harry Potter or The Da Vinci Code have I been so engrossed in a book that I could not put it down. A new book called The MagiCIAn: John Mulholland's Secret Life by Ben Robinson was just released and I have to tell you, it's one of the best books on a magician's life I have ever read. This is so good I even gave it to my wife to read, and she could not put it down. (I should have bought two copies!). This is not just a book somebody spent time researching over the internet, this is a a book the author spent over thirty years piecing together and investigating, and it really shows. If I ever wanted to hire a person to write my life story, Mr. Robinson would be the man!! There is so much to learn from this book, I had no idea Houdini's relationship with John or that he lived so close to him growing up - I can only imagine the thrill. The whole CIA aspect was also news to me, and again, absolutely enthralling. The inside knowledge the author has shared with the readers is truly outstanding. Mr. Robinson's writing is extremely intelligent and a joy to read. He captures the essence of a story that many people had heard about, but really not to the depth that the author knows. The fact that the author was bequeathed a private CIA file by Maurine Christopher in 1997 is an amazing story unto itself. Here is a book that will capture the imagination of magicians and lay people alike. You have brought John Mulholland back to life for a new generation and given him the recognition he so rightly deserves. Your book is packed with facts and after reading it one cannot help but totally admire Mulholland. He emerges as grand and wonderful man who was a true scholar of magic. I gained new insights on Mulholland from your book. John Mulholland marked the field of magic with a stamp that perhaps changed much of history. Yet even though he edited the Sphinx (the longest-running magic periodical and the most influential of its time), was friends with the greatest names in magic, and influenced them and many others -- his name just isn't that well known outside our little circle. Even within our subculture, how many of us know just who John Mulholland is? There have been ugly accusations that he may have helped kill a scientist in the 1950s. There have been rumors about his moral and immoral activities. There have even been accusations that he did not write the many articles and books with his by-line. There is even at least one generation who has no idea who he is. Ben Robinson spent almost as many years researching this, the first biography of John Mulholland, as Mulholland spent editing the Sphinx. He interviewed key personnel and uncovered many previously classified documents -- thank goodness for the Freedom of Information Act!! And from the zillions of jigsaw puzzle pieces he discovered, he put together a fascinating document which is compelling reading. The CIA in the title of MagiCIAn refers to Mulholland's work for the newly-formed CIA. You'll have to read the book to learn just what that was, but it well blends the profession of magician with that of intelligence agent. When there was serious research into possible defense uses of ESP, mind control, and remote viewing; anything could - and did - happen. Magicians will enjoy this. Mentalists will find much to learn herein, and will catch subtleties which might be lost on others. Soldiers and military historians will find this to be exciting reading. I've been all the above, and I loved this book!